PRAMA Initiative a également une page sur Rival LOL glitch. This glitch will print a character of the Rival's name at x=01 y=06, which can be used to catch a Pokémon with the same ID as the character. The Rival name can also be altered with the expanded items pack. Rival LOL glitch/CoolTrainer or Rival name LOL glitch/CoolTrainer is a derivative glitch of LOL glitch or CoolTrainer♀ corruption discovered by luckytyphlosion. Using an 'unterminated name item', a 'tile printing item' that prints the Rival's name and a 'screen data saving item' one can capture a Pokémon based on the ID of a character in the Rival's name. Via the expanded items pack, the Rival's name can be manipulated by adjusting an item quantity, allowing the player to continuously catch Pokémon. Despite being a relatively complex glitch, it is rather useful for obtaining the bootstrap Pokémon for glitch item "ws m" (hex:63) in Yellow after obtaining the expanded items pack and obtaining glitch Pokémon where there aren't many methods to obtain them. 1) Hex:9E item: Super Glitch item, "tile writer"
2) 9F (hex:5E): "screen data saver", "battle escape item"
3) Pokémon with "-" as the first move; which can be obtained by using Ditto, encountering a Pokémon, transforming into it, swapping the 2nd-4th move with the first move and escaping. 4) A six letter long rival name. 1) Hex:80 glitch item (both a Super Glitch item and tile writer item). 2) -gm (hex:6A) (both a battle escape item and screen data saver). 3) 9F (hex:5E) - Does not work like Red/Blue's 9F. This is used to refresh the graphics after 'partially' (so that D057/D056 still equals 01) escaping from a battle with -gm. 1) Perform the LOL glitch, escaping from a Pokémon with -gm (or 9F if using Red/Blue) and then if using Yellow, 9F near Fuchsia City first. Some Pokémon might not work for the glitch later, so it is a good idea to ensure the Pokémon is Doduo which does work. 2) Don't fly away after escaping from the Doduo or you'll make D057/D056 00 (meaning you can't catch your Pokémon at the end of the glitch). Go to a special spot (below) with hex:80 at the top of the page and -gm below it on the same page. Make sure there is a bottom-left tile of a bush tile on the screen, if not open the Pokémon menu and close it. 3) Make the cursor point to hex:80 (but don't press A on it), use -gm (Yellow) or 9F (Red/Blue) to save the screen dump, and then press A on hex:80 (Yellow) or hex:9E (Red/Blue) but cancel out. 4) Throw a Master Ball (you can do it even though you appear out of battle), and you'll get the Pokémon or glitch Pokémon depending on the fourth letter of the Rival name provided it's a working one (not a control character like 50h). 1) If you want to do the glitch again, save and reset after obtaining your Pokémon. Trying to do another Rival CoolTrainer (or probably LOL glitch) in one session will give you bad tiles that obstruct the 50s (bottom left bush tiles). 2) When you enter Diglett's Cave and catch the Pokémon, remember to open the menu and close it before leaving the cave. This is to avoid a possible freeze. 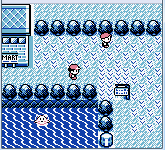 3) Sometimes the bottom left bush tiles disappear, but opening the Pokémon menu and closing it makes them appear again. 4) For the CoolTrainer method, Ditto may be given a status problem after the foe's species mutates, so remember to heal it at a Pokémon Center or with a Full Heal before doing the glitch again. This glitch writes a tile from the fourth letter of your Rival's name (must be 6 letters long for this demonstration) into coordinate y=01, x=06 (the position for "-" move corruption that determines the foe's species) thanks to the hex:9E item (a 'tile writer' item) when it is in the first position, and a certain place (http://i.imgur.com/s5AZIod.png) in Fuchsia City with a roof tile (hex: 53; a control character which prints the Rival's name) and a suitable position for a 50h (prevents freezes for CoolTrainer and LOL glitch). For the LOL glitch version, we first escape from battle using a partial escape glitch item (9F in Red/Blue or -gm in Yellow). We then go to the special spot in Fuchsia City (above) and use 9F (Red/Blue) or -gm (Yellow) (should be on the same page as hex:9E) to make the game 'save' the screen data. Lastly we use an unterminated name glitch item to perform a version of LOL glitch with the Pokémon based on what appeared at y=01 x=06 before using 9F. If using CoolTrainer, we perform the same steps but without escaping from battle, Fly to Diglett's Cave, don't open any more menus, and corrupt the enemy Pokémon to turn it into the species depending on the index number of the fourth letter. Even though the results 'should' be limited to characters you can choose on the new name screen, there is a way to get the fourth letter to be any character, described below. Note that you can't get everything; as certain values don't show up on the screen as tiles, namely $50, $51, $56, $57 and more, yet we can still get rare Pokémon like Mew, Ditto glitch Pokémon, Time Capsule exploit glitch Pokémon and FB-FE! If you have an expanded items pack via the dry underflow glitch, then you can change the 4th letter of your Rival's name to what you like by tossing from an item quantity past slot 20 (item 24's quantity). The quantity may be too low at first, so when you get to the spot you can swap the x position block (item 35's quantity, usually 01 or 00) value into it when it is 00 (256) and then toss from it. You can also change the length of the Rival name to 6 by adding a 50h in slot 7 if it isn't already and removing 50h earlier than slot 7. These will be nearby item 24 and either look like an Ether or quantity of 80. Note: If you use a tile writer item other than hex:9E the game will likely write the wrong character/tile in x=01, y=06.